These Banana Coconut Muffins may just be one of my new favorite variations on traditional banana bread. They’re much quicker to make than a full sized loaf and are incredibly satisfying to eat – especially if you enjoy all baked goods with banana and coconut. While I wouldn’t consider banana bread to be a tropical dessert, adding some shredded coconut to the mix definitely gives these muffins a slightly tropical vibe. While I frequently point out that you can use unsweetened and sweetened coconut interchangeably in almost any recipe, I recommend the sweetened one for these muffins because that bit of additional sweetness really helps to highlight the coconut. That said, there is actually a great balance of both banana and coconut in these muffins and you’ll taste both in every single bite. The vanilla in the muffin batter comes through very well, while the spice of the allspice is very subtle. Cinnamon can be used in place of allspice, if you don’t have any on hand, but the allspice adds a lovely hint of complexity to the mix. The muffins are made using the traditional “muffin” method of combining the dry ingredients and wet ingredients together, with one simple twist: the butter is added in last. Adding the butter in last really tenderizes the muffins and gives them a great texture. 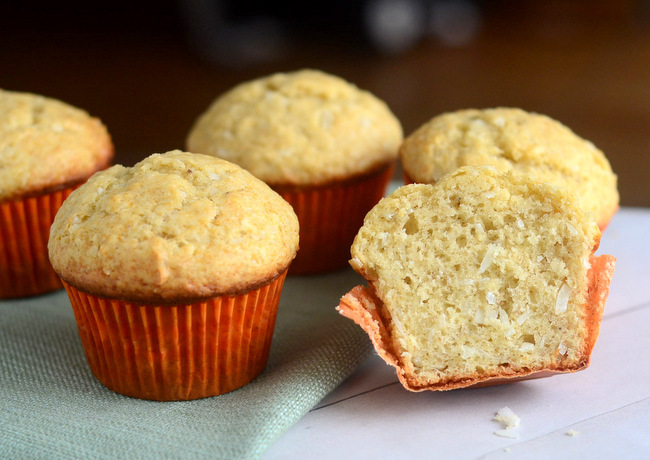 While there are some muffins that should feel light and fluffy, the denser crumb works perfectly here with both the banana and coconut elements of the muffin. Your muffin cups should be filled almost to the top and you should get a great rise from your batch, due to the generous amount of baking powder in the batter. The muffins are baked at 375F, which helps to produce a slightly crisp top while preserving all of the moisture from the mashed banana in the center of the muffins. These keep extremely well and can be stored in an airtight container for a couple of days after baking. I like to serve them slightly warm, with a bit of salted butter on the side. Preheat oven 375F and line a 12-cup muffin tin with paper liners. In a medium bowl, whisk together flour, baking powder, salt and allspice. In a large bowl, whisk together sugar and eggs until well combined, then whisk in the mashed banana, milk, and vanilla extract. Add dry ingredients into wet ingredients and stir until just combined, making sure no streaks of flour remain. Stir in melted butter and shredded coconut until batter is uniform, then divide evenly into prepared muffin pan. Bake for 20-22 minutes, until the muffins spring back when lightly pressed and a toothpick inserted into the center comes out clean. Turn muffins out onto a wire rack to cool completely. Looks so delicious and perfect as a sweet breakfast or snack!